Genpei Touma Den: Computer Board Game (源平討魔伝 コンピュータ ボード ゲーム, genpei touma den konpiyuuta boodo geemu?, "The story of exterminating demons during the Genpei period: Computer Board Game") is a RPG-like computer board game developed by Namco for the Famicom and published in Japan in 1988. 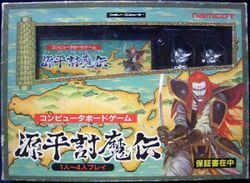 The core concept is derived from the arcade game Genpei Touma Den, where the player controls Taira no Kagekiyo and attempts to defeat his nemesis Minamoto no Yoritomo. However, the side-scrolling action sequences of the game gave been replaced with an overhead map, and a turn-based combat system. Kagekiyo travels the country searching for his eternal nemeses all the while fighting youkai and other monsters. These fights are depicted as one-on-one turn-based struggles where the player and creature's health is depicted as candles. Kagekiyo can regenerate health at shrines by spending money and can also level up stats at torii gates by spending "toku", or virtue. Both money and toku are earned defeating enemies. Along with the cartridge, the contents of the box includes a cloth map of feudal Japan, player figurines, and cards. Up to four players can play together. The ultimate goal of the game is to conquer all of Japan, or more of it than your opponent. This page was last edited on 6 November 2014, at 02:36.